Happy May! 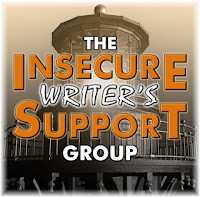 It's the first Wednesday of the month, and that means it's time for the Insecure Writer's Support Group, where we throw our insecurities to the wolves that are other insecure writers. Visit the website and the captain of this crew, Alex J. Cavanaugh to participate and visit the co-hosts for the month. I totally do not remember what happened to make May fly by like it did. I'm pretty sure I read two books. *looks at Goodreads* So I read one book, and that was poetry. I took one more look at Fractured Princess to clear up any typos and continuity errors. That only took me a week, as I had my office to myself for a couple days. BUT, I did get a lot of work done on a joint project which I can't say much about yet, but I'm very excited! It might involve a bit of travel so I can work with my friend, but it depends on her schedule and my money flow. I just can't wait to share it! This month's question: What's harder for you to come up with, book titles or character names? Well, for a while there, while I was writing YA Romance that no one will ever see, my book titles were the names of the two main characters, so obviously, I had no idea what to name the books haha. Character names come much more quickly for me, unless I need to change them, which I've done to two characters: Jonnie in Fractured Princess and a character formerly named Remi in my NA/A Fantasy project. He's a guard to a princess, and as I read The Belles, I learned there is a guard named Remy, and I was like, "Aw, crap." haha I would've kept the name, but Remi is going to be a pivotal character in my story, as is Remy in Dhonielle's from the looks of it, so I can figure something else out by the time I write "the end" on that project. How about you? How was May? Can't wait to hear about your project. If you still write young adult romance, you'll be interested in our upcoming anthology contest then. Travel sounds like fun. Enjoy it. Character's names for titles. Why not? May was kind of lazy for me. I tried to write, but didn't get very far. Hope to do better in June. Have a great week. Character names are easy. Book titles very difficult. I don't know what happened to May. I don't really know what's happened to the whole year so far. It's flying by! I always find character names much easier than book titles. Most of my book ideas have terrible placeholder names. I love the title 'Fractured Princess'. A dual project sounds like fun...I think. I've wondered how it would be to write one of those, but if it's with your friend, I'm sure it will definitely be fun. Good luck with it! June is moving right along, nearly as fast as May! As an indie writer, I get to make up my own titles, but, like you, those character names are a little more difficult. Are you going to write a short story for IWSG's YA Anthology in September???? Have a great June! Ooh, how exciting about that joint project! Looking forward to learning more about it. And LOL, I used to call my webcomic "Nicholas and Coco" for the longest time, so I can relate to your YA Romance titling woes. Also, shame how you have to change Remi's name, but totally understandable at the same time. Good luck figuring out a replacement!